Friday Mix and Mingle Approximately 40 members and partners enjoyed good company, a beer, and the sun shining through the lounge windows at the Browns Bay RSA, before moving to the upstairs restaurant for a la carte dinner. Brig (rtd) Graham Birch was welcomed as the new Patron of the RNZA Assn, Tony McLeod was re-elected President (unopposed), 4 sitting members and two new members were elected onto the committee. Three other members volunteered for the committee later in the weekend, and their offer was accepted immediately! The appointments of Secretary, Treasurer, Webmaster, will be determined at the first committee meeting. The motion to make Full Membership automatic and free was passed unanimously, signalling the start of a new era for the RNZA Assn. Mike Dakin was elected as a Life Member of the RNZA Assn for all his work on the blog and web sites (in addition to his efforts as Secretary/Treasurer, and Vice President). Three senior members of the K Force Assn attended and announced that their Assn would probably be closed down next year (October 13). Lunch was an informal affair in the RSA restaurant, after which about 20 members drove to North Head for a tour of the Gun Emplacements. Some were privileged to travel in Colin Jansen`s WW2 Jeep, and their bruised backsides were testament to the joy experienced. Semi-Formal Dinner. 85 members and partners sat down to a great dinner , magnificently served by the North Shore Cadet Unit. 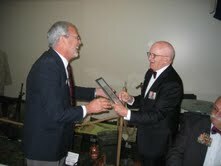 The Toast to the Regiment was proposed by Dr Wayne Mapp (ex Minister of Defence), who reassured the audience that there ‘probably’ is a place for the artillery in the future. Diners were treated to background music by `D Starlights` and everyone enjoyed the warm and friendly atmosphere of the evening. 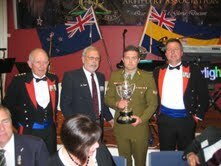 The President presented the RNZA Assn Trophy to Bdr Andrew Smith, for best displaying the qualities expected of a gunner through 2012. (See Citation later). 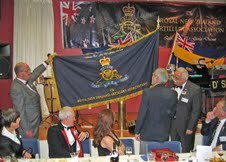 The Australian group - President Kim McGrath and his six fellow members - left the diners in awe when they presented the Assn with a magnificent banner, beautifully gilt embroidered with RNZA Assn name and badge. 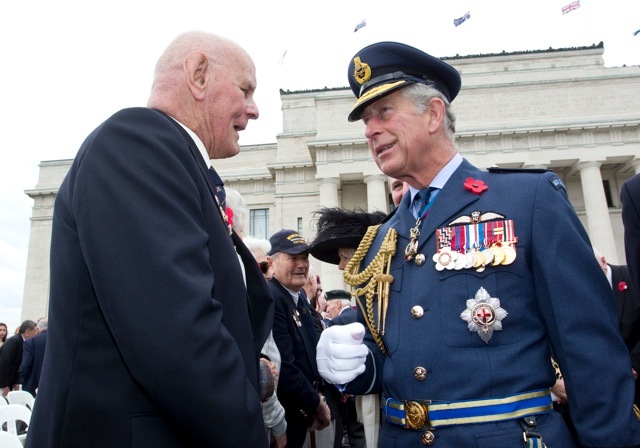 Approximately 40 members attended the Armistice Day Service held at the Auckland War Memorial Museum. Also in attendance at the service were HRH Prince Charles and his wife Camilla, the Prime Minister Mr John Key and Bronagh, and the Mayor of Auckland Mr Len Brown. 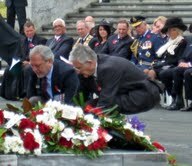 Tony McLeod laid a wreath on behalf of the RNZA Association. After the service HRH and the official party moved along the row of RNZA Assn members, shaking hands and chatting with many of them. Members were then invited to morning tea at the top floor of the museum. A memorable weekend which paid tribute to the past, provided a sound building block for the future, and which everyone who attended thoroughly enjoyed. Congratulations to the organisers and thanks to all the members who attended.